Can anyone do an Ohio State avatar? My old one from LG that Cam made me a long while back won't fit under the requirements for the site. Just something cool that incorporates the Ohio State logo or something, maybe like the Flyers one above. Sure thing Jason, For someone who wore the avatar I made for that long, I will do another in a heart beat. Do you just want Ohio state or more Ohio teams? Not bad for 1.5 mil eh? i will put a request out there. 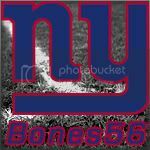 Simply put a ny giant logo with my gamertag on it.. that would be cool.. Thanks Cam. I don't know what all you can incorporate with the size limits, but if Ohio State and the Bengals could be incorporated I'd appreciate it. The Jackets, Indians and Cleveland Cavaliers are my other favorite teams. Cavs are probably #3 behind OSU and the Bengals. I just realized I capitalized your username. If you want me to change it, let me know. It's a very simple one to say the least. That looks awesome Cam, thanks. Could I get a Minnesota T'Wolves with Mike Miller, Al Jefferson, Randy Foye, Kevin Love? Like the logo in the background with the players fading in and out after a few seconds?